Ok, I took a long break since the last part. I'm pretty bad at being active especially with a lot of work to focus on but without further adieu we will start building our meshes to be viewed in 3d. This is probably what a lot of people had in mind when they started this tutorial series but I promise, with the understanding gained from the earlier tutorials this part will come a lot easier. However users that haven't followed the last 4 parts are welcome to start here but I won't be going into as much detail about how meshes are created. Also this tutorial and the next one I'm writing as I go instead of using parts of my finished code (of course still using that as reference) so I'm hoping that will help stop me from making as many mistakes as I shouldn't skip things or have to make changes to things as I past them to the tutorial as much. 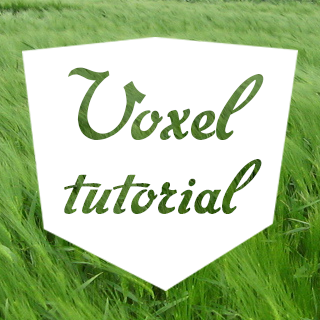 Let's start by making a new scene in unity with an empty game object. Name that object "Chunk", this will be the mesh for a 16x16x16 area (Or larger) of our world. Also make a new script and call it "Chunk" as well because it goes on the chunk object. Let's make our code create one cube to start. When you're adding these remember to include the line "using System.Collections.Generic;" from line 3 up there. Now, this should look pretty familiar, same lists of verticies, tris and UVs, a tUnit and texture coordinates, our mesh filter and mesh collider and lastly a faceCount which is just a new name for the squareCount we used in the other script. After you've done this go to unity and add a Mesh Filter, a Mesh Renderer and a Mesh Collider to our Chunk game object. CubeTop will be one of six functions that generate a side of the cube and update mesh will commit the verticies and things to the mesh filter. We'll just start with the top to get it working. faceCount=0; //Fixed: Added this thanks to a bug pointed out by ratnushock! What's happening here? Well CubeTop runs first and it creates verticies for a square facing upwards using the x,y,z coordinates, then it creates numbers for the triangles using the faceCount and lastly it applies the texture at the coordinates to the face. For now though texturePos is just set to tStone. We'll add some ifs to set the texture once we have more than one cube. Now lets hop over to unity and place our gameobjects so that we can run. Put the Chunk at 0,0,0 and set the camera's position y to 10 and rotation x to 45. This should put it dead center. So as you can see there are no textures yet and it's just the top face so let's add the materials first of all. Just drag the tilesheet texture onto the chunk gameobject (for those of you who haven't done the previous tutorials, the tilesheet is a 128x128 size image with 4x4 tiles. Here's the one I'm using: Link!). For the rest of the faces the functions will be quite similar, all we'll be doing is adjusting the verticies. Pretty much the rest of the function will be the same for every face so what we'll do is remove the common parts of the functions and put them in a separate function instead of having it written out for each face. So create a new function called Cube with a Vector2 called texturePos as a parameter, this function will be called for every face and run all the code common to all faces. Move the newTriangles lines to it and the newUV lines to it. Then add "faceCount++" to the end. Now we can make the other five functions, they'll look just the same as this one except that they'll use different coordinates for the verticies. Later on they will also decide what textures to use in the unique functions but for now just keep using texturePos=tStone. Now you should have 6 functions and one common function for the faces of the cube. Go to the start function and add the five new functions after CubeTop with the parameters 0,0,0,0 for all of them. If you run it in unity now you should see a cube, not so visible in the camera view but if you look around in the scene view you'll see it. 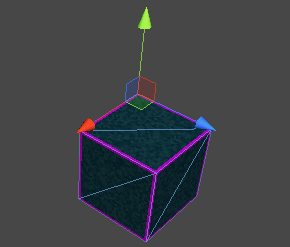 And you'll have a cube with a collision mesh! I'll end this part here, it seems like a logical point to stop but what we have now is more than a cube, what we have is a system to create individual faces which will come in very handy when we're creating a surface that resembles cubes but is actually made of just the visible faces. But that's for next time. Until then please message me with any problems you find and follow me on twitter or google plus to get updated! There's something you should fix. Quote: " After you've done this go to unity and add a Mesh Filter and a Mesh Collider to our Chunk game object. " A "Mesh Renderer" is also required otherwise we get nothing on screen when you told us to place the camera at pos=(0,10,-10) rot=(45,0,0). If I find anything else I'll send another comment. Thanks so much ratnushock, I added this and the faceCount=0; line that you mentioned in another comment. Awesome, works well. That really simplifies making a box. Its really not that hard when I understand how it works. Thanks heaps I'm learning lots. > "Now lets hop over to unity and place our gameobjects so that we can run. Put the Chunk at 0,0,0 and set the camera's position y to 10 and rotation x to 45. This should put it dead center." However, when I did that it wasn't in view of the camera. I had to set the camera's X rotation to 90 and that put it dead center. Maybe I did something wrong? You didn't do anything wrong. When you add gameobjects to the scene there position can vary. If you have Chunk at 0, 0, 0 and the camera at 0, 10, -10 with x rotation at 45 degrees you should be able to see it exactly like the tutorial. Change the code "Vector2 texturePos;" to "Vector2 texturePos = new Vector2();"
Hey, can we get download for this file as well? I ran into an error in part 6 with copying/pasting the noise script and I need to go back to this part and do part 6 over. I don't know where I went wrong, and I even went so far as to copy and past everything at least 3 times, and I cant figure it out. Nevermind, I figured it out, by closing unity and opening it again. I have a problem, my cube faces are all rendering one way, so you cant see the bottom or the back two sides. Thanks for the awesome tutorial though. I used a double sided shader so that I can see the faces, however there is still some dodgy lighting problems. Is there any way to fix this? 2017 and i had the same problem, some fix? I'm kind of getting the image in the picture, the problem is that when I rotate the cube the faces disappear at random, they disappear more as the cube rotates, I don't know if it's a unity bug or a problem with my code, but I'm pretty sure that I followed the code exactly, if anyone has a similar problem or can help I'd really appreciate it, as I'm pretty new to unity.